Where do you start with Kevin Smith? With his smash hit Clerks from 1994, the opinionated movie buff was considered the patron saint of vicariously eloquent stoner comedy. Eighteen years down the line, Smith has become a part of the counter-Hollywood film furniture; creating a dozen films which have never been able to surpass the critical and commercial successes of that socially aware debut. Hanging up his director’s hockey jersey after last year’s particularly out-of-character indie-horror Red State, what better time than now to go back and scrutinise some of his directing misfortunes? Answer: none. None better. 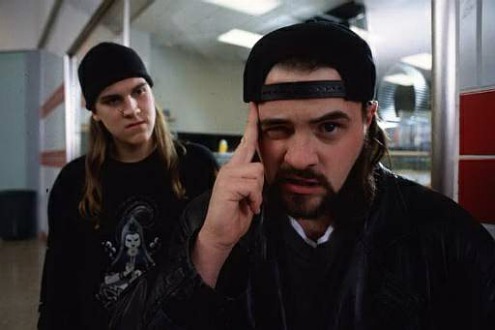 Following the afore mentioned Clerks, Mallrats adopts all of Smith’s slackerdom ideas, yet manages to create something surprisingly languid and unimaginative. Whip out the doobie snacks and slip this review in your ears. It very possibly could change your life. PS – Thanks to friend and loveable curmudgeon Tom Hinton for suggestion this film. He’s an editor-in-chief of a super tasty online culture publication called Mint Magazine. You can follow his twitter feed right here. This entry was posted in ★★☆☆☆ (2) and tagged Clerks, Hulu, Jason Lee, Kevin Smith, Mallrats, Red State, Stan Lee. Bookmark the permalink.